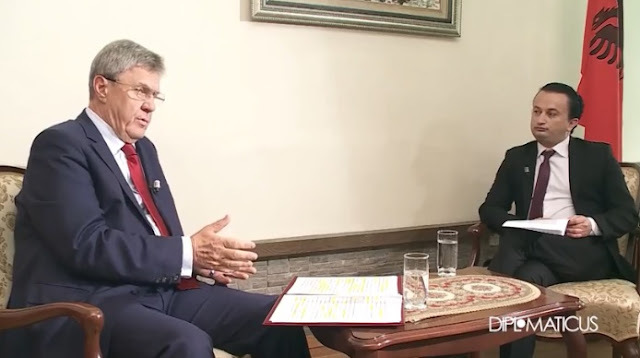 The information that during the meeting between Putin and Trump has been reached some backward agreement regarding Kosovo, it is not true, stated the Russian Federation's ambassador to Albania, Alexander Karpushin, in an interview to the Diplomaticus show in News24. According to Karpushin, "Russia is aware that in the framework of Belgrade-Pristina talks has been raosed the issue of possible border correction, but the discussion of this issue between representatives of Serbia and Kosovo had started before the summit in Helsinki, Trump-Putin." "Russia is not pursuing and does not intend to pursue any secret agenda on this issue. We fully support the current Belgrade-Pristina talks, but we continue to stick to the position that, as noted by Russian President Vladimir Putin, 'issues that are related to Kosovo's status must be resolved on a political path based on dialogue between the parties and in accordance with United Nations Security Council resolution 1244, which remains in force. At the same time, the Russian party's conviction is that there is a need for a strong consensus, which would avoid violating the interests of one or the other participant in this process. Only such an approach can bring a positive impact to the whole region. I would like to emphasize that responsibility for the success or lack of success of these talks belongs fully to the European Union, which has taken the role of mediator in this dialogue." Following the border correction theme, the Russian ambassador states that when it comes to such fundamental transformations as the border revision, we must bear in mind that this is a very sensitive and explosive issue. According to him, a transformation like this is unfeasible without proper constitutional changes and without a detailed analysis of the possible consequences of such a resettlement. And the final decision should be taken only on the basis of the citizens' opinion of those parties, who participate in such a process. The Russian diplomat also stops at Moscow's relations with Tirana. "In one of your questions you mention the formula" one step forward and two steps backwards." The situation is that in our relations with Albania we are obliged to act according to the formula "no step forward," so in the best case we stand in stagnation. And in this situation, the only thing left to us is to rejoice in exchanging congratulations once a year on the occasion of national holidays," said the Russian Ambassador to Tirana Alexander Karpushin.